Oh Rigatoni, how I love thee! 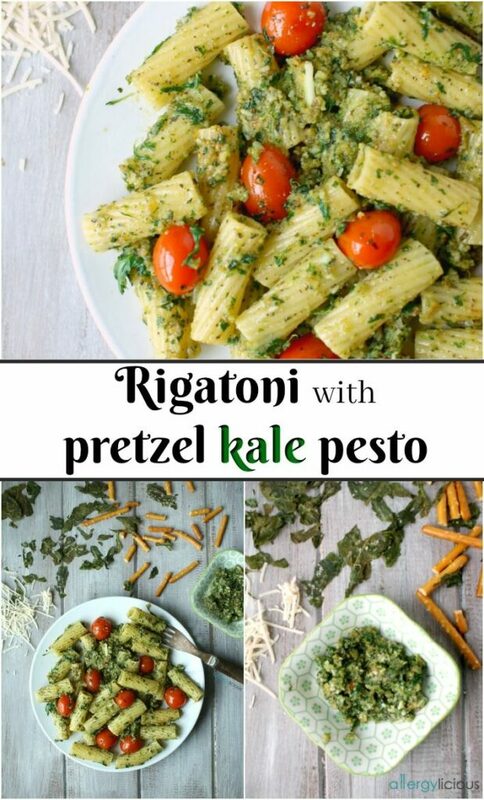 Especially when tossed in a vibrant Kale & Pretzel Pesto! This is a wonderfully simple dish that you can throw together in less than 20 minutes. 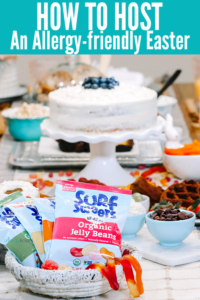 It really doesn’t get much better or easier than that (not even drive-thru) and as always, it is free from dairy, eggs & nuts (it’s also gluten-free & top 8 free). 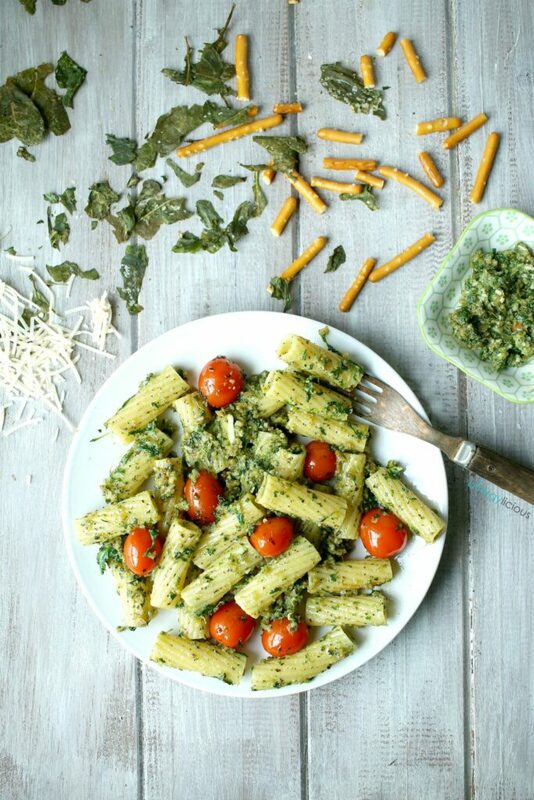 With a name like Rigatoni Pretzel Pesto, you’d think that pasta is the star, but let’s be honest here, the real show-stopper in this recipe is the pesto. 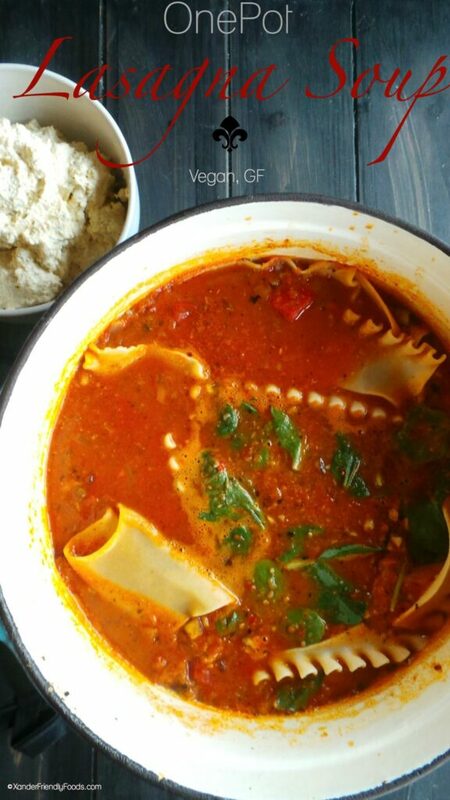 Of course you NEED the pasta, but without this amazingly, delicious and vibrant sauce, it would simply be a big bowl of noodles. 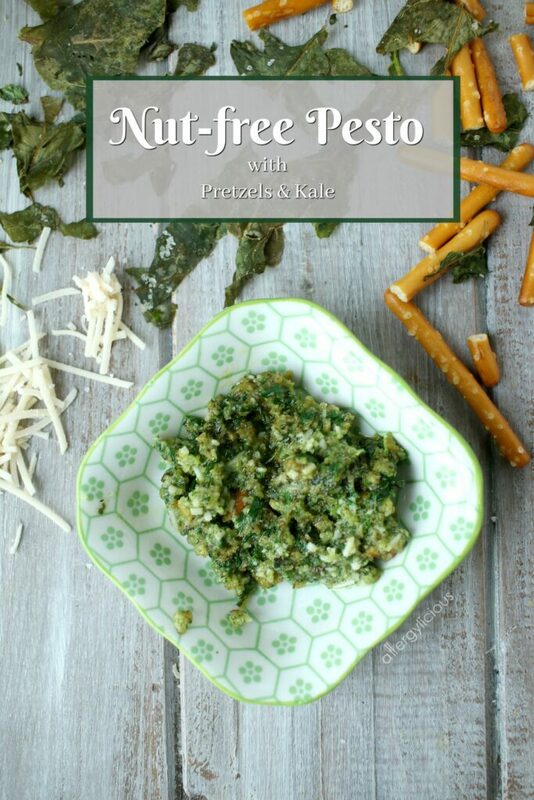 But there are two things that make this pesto rock……KALE & PRETZELS! Both are used not only enhance the flavor but also to give it an extra boost while keeping it completely allergy-friendly. So let’s talk about the kale! This little green leaf takes on 2 roles. 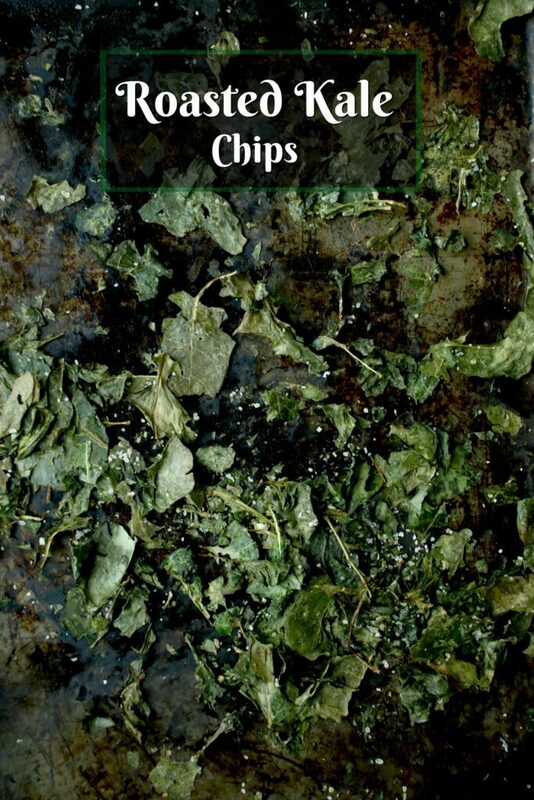 The first half of your batch is salted & roasted, to make crunchy, homemade kale chips. Those get sprinkled onto your pasta at the end (if they last that long). But because the pesto is the “star” the rest of the kale is sautéed with garlic slices then added to your blender with the rest of your pesto ingredients. Talk about yum! Now I know what you are thinking…”what’s with the pretzels?”. That’s my secret weapon! Instead of using some type of nut or opting for a seed-based pesto, I used gluten-free pretzels instead. Talk about wanting to lap it up with a spoon. Thank goodness for times when your pantry is bare and you have to be creative. If my kids didn’t devour all my pepita & sunflower seeds, I’m pretty sure this recipe never would have happened. Now, no pesto is complete without cheese but don’t let your restrictions keep you from making this. 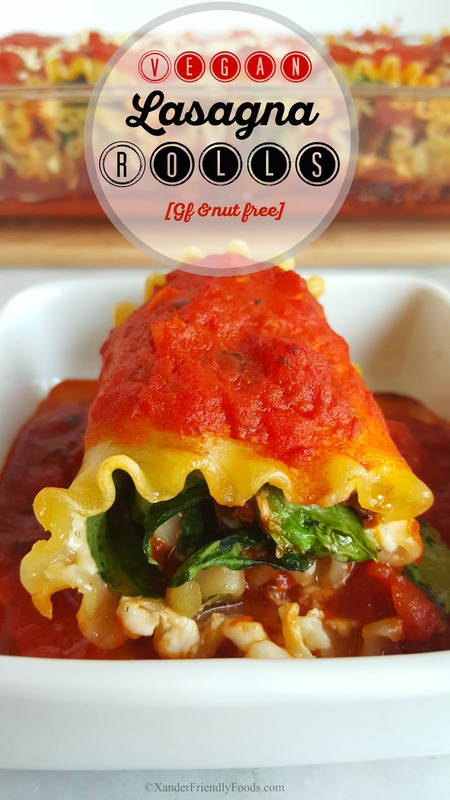 We already got rid of the nuts, using a “safe” pasta keeps it gluten-free and now we are making this dairy-free. So to get the amazing, cheezy flavor of pesto, I used Follow Your Heart’s parmesan shreds. It is vegan and free from dairy, soy, and gluten. I just love how a little sprinkle can upgrade the flavor! A little bit also blends perfectly in the Kale & Pretzel Pesto, making it “oh so amazing”. See, it does come back to the pesto. 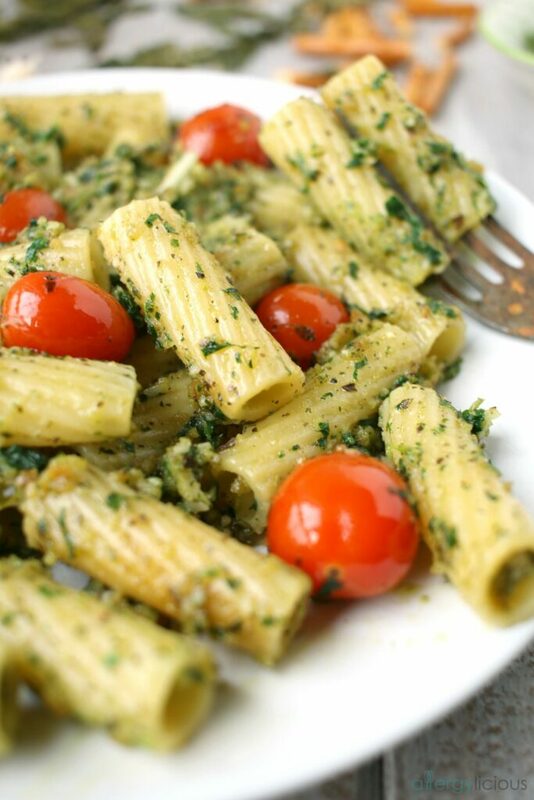 Even if you’ve never been a fan of pesto, let me start by saying that my kiddos ATE THIS UP! Like, they went back for seconds, took it to school the next and didn’t leave me any for my own lunch! 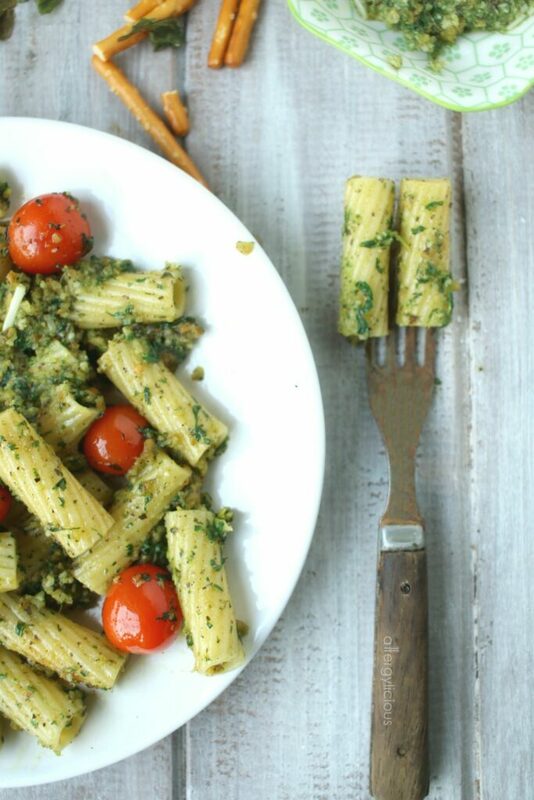 You guys are going to LOVE this pesto! It’s the only one that’s gotten 5 “thumbs up”. You just have to try this stuff! Feel free to change out the pasta but I just love how the pesto falls into the ridges of these rigatoni noodles instead of the bottom of the bowl. 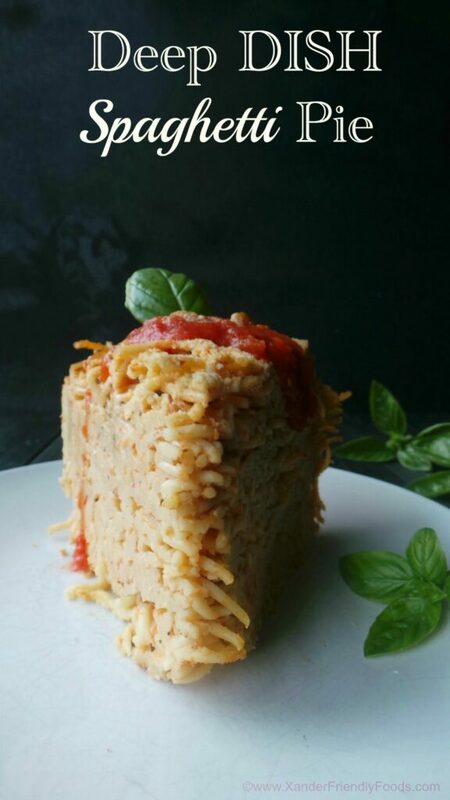 Perfectly cooked rigatoni layered in flavor. This pasta is topped with our creamy, (nut-free, gf) pretzel pesto then sprinkle on crispy kale chips to bring magic to dinner time. Preheat oven to 350° and have rack in center of oven. Place half of the kale leaves in a large bowl and toss with 2 tablespoon olive oil & 1/2 teaspoon salt. Arrange kale in a single layer, trying not to overlap (grab an extra baking sheet if needed for overflow). Roast 4-5 minutes then shake pan to redistribute and bake another 4-5 minutes or until leaves are crisp (8-10 total). Remove from oven and set aside. Bring a large pot of salted water to a boil. Add rigatoni and cook until al dente (approx 1 minute less than recommended on box). Drain pasta but reserve 1/2 cup of liquid. While pasta is cooking, heat 1 1/2 tablespoons of olive oil in a large skillet over medium. Add kale other half of kale leaves and sauté a minute before adding garlic slices. Cook until kale is wilted and garlic is fragrant. In a food processor or high quality blender, toss in basil, vegan parmesan and a pinch of pepper and process or pulse until combined. Add sautéed kale & garlic blend with the pretzel sticks and blend while drizzling in remaining olive oil. Slowly add in liquid from pasta a little at a time if needed for a more liquid consistency. If using tomatoes, toss them in the pan and saute for 2 minutes then add cooked pasta with the pesto and combine as you are reheating. Serve plated and sprinkle with kale chips. *I freeze my extra basil leaves in a silicone Herb Tray with olive oil. If you use a similar method, you can then use 3 cubes with a full teaspoon of dried basil in place of fresh basil . (I rarely have any on hand but I always have this option). **This recipe can easily adapt to using another green in place of kale. Spinach, Swiss chard, or even Beet Greens can work. Craving more quick & easy pasta recipes? 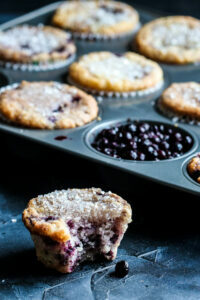 Have you ever used an “odd” ingredient in a pinch that turned out awesome? 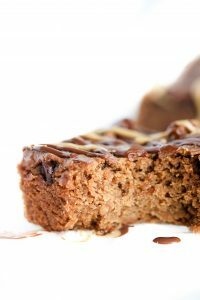 What food allergies or restrictions do you adhere to when cooking/baking? Right? It really pushed me to be even more creative and I’m so glad I stuck with it because we just all loved this pesto. What an interesting pesto recipe! I’ve used kale in pesto, but never pretzels. I have to try this. Thanks, Nicole! I love that you used pretzels in this recipe in place of pine nuts. So creative and your pictures are stunning. Can’t wait to try it. I’m in love with this. My son cant’ do Kale-but perhaps we could sub another green. I’ve been meaning to try the Follow Your Heart parm–where do you find it? I love how quick and easy this recipe is. Thanks Sandi! Yes, it’s always nice to have some easy recipes on hand when short on time. Thanks Uma! I was fun changing it up and seeing my kids love it so much.